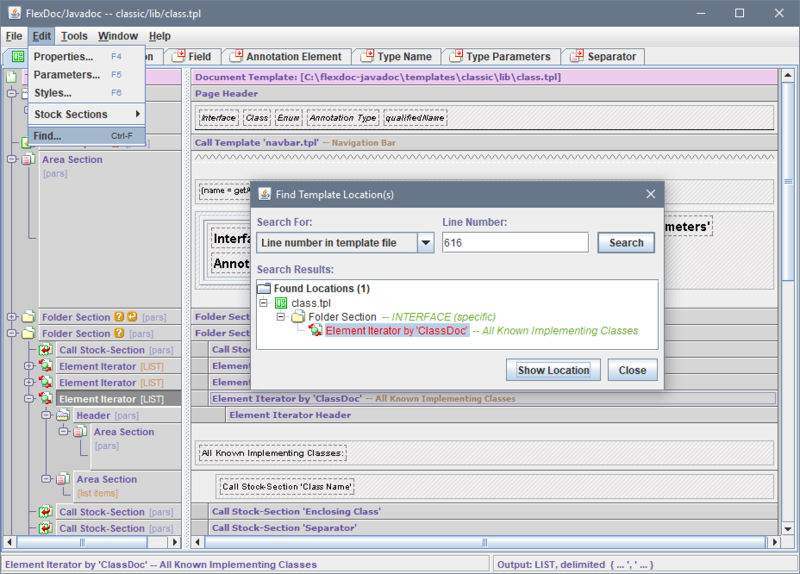 “FlexDoc Doclet” is an incapsulation of FlexDoc/Javadoc Template Processor in the form of a Javadoc doclet. javadoc A system command that starts Javadoc. 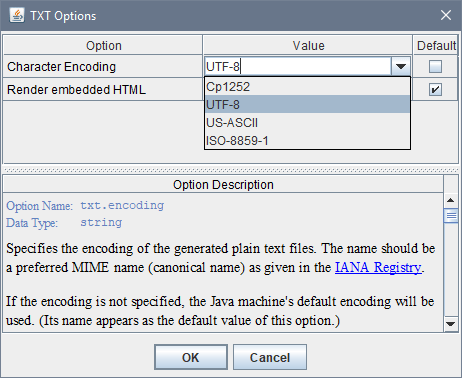 [VM options] The options passed to JVM that runs Javadoc. When you generate documentation for a big project, it is important to ensure that JVM will allocate enough memory for the heap (otherwise, the generator will slow down and may run out of memory). The maximum heap size should be specified here using -J-Xmx option. For example, setting -J-Xmx256m will allocate 256 Mb for the heap. FlexDoc generator may need a lot of memory as it stores lots of temporary data in hash-tables in order to boost performance. However, according to our tests, 256 Mb heap appeared to be quite enough to generate an RTF documentation for a project with something close to 1000 Java classes. That was on 32-bit Java. So, on Windows 64-bit you should specify -Xmx512m, instead of -Xmx256m. -docletpath The Javadoc -docletpath option to specify the path to the doclet starting class file. <doclet_class_path> This must be the pathname of the FlexDoc/Javadoc Java library file. -doclet The Javadoc -doclet option to specify the fully-qualified name of the doclet starting class. [options] All other Javadoc options. 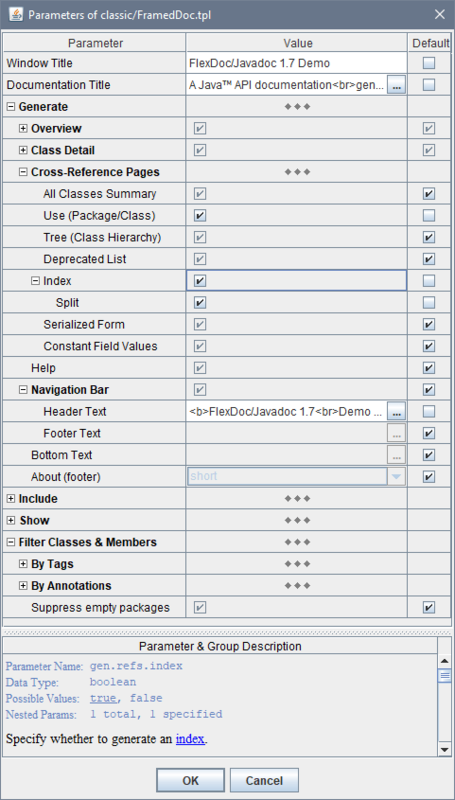 This includes both the Javadoc core options and the options processed by the FlexDoc Doclet (see below). [-subpackages pkg1:pkg2:...] Specify the Java packages and classes to document. Since all informative content of the generated documentation is programmed entirely within templates, it is the matter of template parameters to control this. The templates parameters are passed via the -p option. The output formats do have their specific options. But since such options are different for each particular output format and the number of supported formats will grow, all output format options are specified in the uniform way via -o option (the same as the template parameters). Effectively, the number of various generator settings may be so great that the FlexDoc Doclet provides a different and more convenient way for specifying all of them – the Doclet GUI. 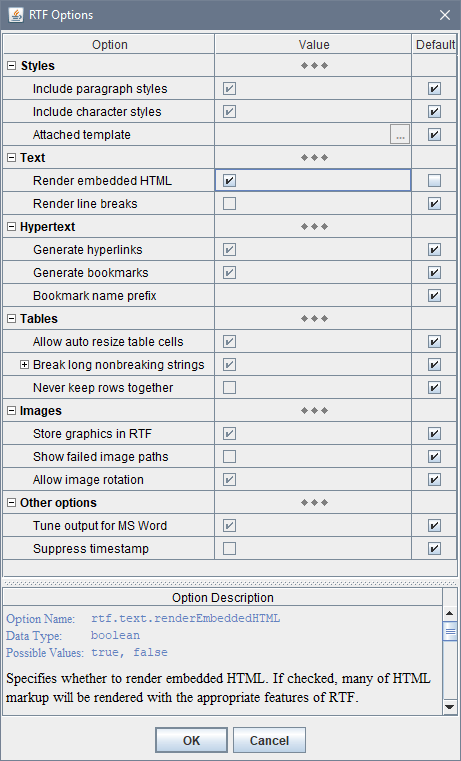 Specifies the main template file to be executed by the generator. All documentation generation is controlled by this template. The main template may call from itself another templates (subtemplates) producing either a single output file or multiple files (framed documentation). The boolean values should be specified as "true" and "false" strings (for example: -p:include.deprecated=true). When the parameter value contains spaces, enclose it in double quotes (for example: -p:title "My Docs"). The first variant of this option allows you to specify the parameter with a single command line argument, the second variant breaks the option into two arguments (one for the parameter name, another one for the parameter value). The two-argument variant is necessary for compatibility with Apache Ant. Ant provides a special doclet <param> element with two attributes: name and value. When everything goes into the name attribute and the actual value contains spaces, Ant won't process it correctly. The first variant of this option allows you to specify everything with a single command line argument, the second variant breaks the option into two arguments (one for the option name, another one for the value). The two-argument variant is necessary for compatibility with Apache Ant. Ant provides a special doclet <param> element with two attributes: name and value. When everything goes into the name attribute and the actual option value contains spaces, Ant won't process it correctly. Specifies the destination directory for the generated documentation. By default, this is the current directory (the one designated by "." pathname). This option works in conjunction with the -f option. The output document is placed in the destination directory under default file name 'templatename.formatextention' (for example, in the RTF output format, template SingleDoc.tpl will produce document 'SingleDoc.rtf'). The -f option may override this name. By default, all generated files and subdirectories are placed in the specified destination directory. The frameset file produced by the main template is saved under the name 'index.html'. This is the same as the output produced by the Standard Javadoc doclet. This makes the whole documentation to look as to consist of only two file entities, which may be easier to distribute yet during the generation, especially when different types of documentation are produced from the same Java sources (e.g. by different templates or with the different parameters). Specifies the documentation output file name. This option works in conjunction with the -d option and specifies the name of the main output file (the one associated with the main template). Typically, it should be used to specify a pure name associated with the generated documentation (for example, 'DocletAPI'). However, the pathname may also be used. In that case, it is interpreted against the initial destination directory (specified with the -d option) and may override it. If the pathname is the absolute one, the -d option is effectively ignored. Tells the generator to execute a specific non-Java command to launch an external application able to view the generated result (for instance, an Internet browser to view HTML documentation). Precisely, this command is specified in flexdoc.config file found near flexdoc-javadoc.jar file in the lib directory. Specifies the generator config file, which may contain options written manually or using the Generator Dialog. All options not provided directly on the command line are looked for in this file. The Generator Dialog also uses this file to store all options and parameters specified interactively. If the config file does not exist, the Generator Dialog will try to create it by the provided pathname. By default, the location of the generator configuration file is specified in the flexdoc.config (located in lib directory). If no other config file is provided, it is automatically loaded from that location (if found). Specifies an alternative path to the FlexDoc main configuration file. By default, this file is 'flexdoc.config' which is searched in the directory where the FlexDoc Java library file 'flexdoc-javadoc.jar' is located. If not found, flexdoc.config is created automatically with default settings. Specifies the location of the license file. The license directly specified with this option on the command line will override any other licenses (e.g. assigned in flexdoc.config or found near flexdoc-javadoc.jar). Creates links to existing javadoc-generated documentation of external referenced classes. This option works the same as the -link option supported by the Standard Doclet. The exact processing of both -link and -linkoffline options is programmed within templates using a Javadoc-specific FlexQuery function: getExternalDocURL(). When FlexDoc Doclet finds either -link or -linkoffline option on the Javadoc command line, it processes such an option so that the content of the package-list file referred from it is loaded into a special internal hash-table. Further, getExternalDocURL() function uses that table to translate any Java qualified name into a possible URL of the external documentation. This option is a variation of -link; they both create links to javadoc-generated documentation for external referenced classes. Use the -linkoffline option when linking to a document on the web when the Javadoc tool itself is "offline" -- that is, it cannot access the document through a web connection. This option will work the same as the -linkoffline option provided by the Standard Doclet. See also -link option for more details about how it is implemented. Do not invoke the Doclet GUI. true - if this (or no parameter) is specified, the FlexDoc Doclet starts the generation immediately according to the setting specified on the Javadoc command line and loaded from the generator config (see -config option). Then, the doclet exits. false - this is the same as when the -nodialog option was not specified at all. The Generator Dialog will be invoked. quiet - start the generation immediately (without dialog) and suppress displaying most of the generator messages to screen (see also -quiet option). The generation progress counter will be printed. Specifies the error log file used when the FlexDoc Doclet is executed without the Generator Dialog (i.e. when -nodialog option is also specified on the command line). Using this option, you can assign a separate error log file, into which the detailed ERROR REPORT is dumped each time an error happens. Only brief messages will get on the console in that case. Suppress displaying most of the generator messages to screen. Since Java 5, this option is used by Javadoc itself as one of its core options. If you want to suppress only FlexDoc Doclet messages but still see the generation progress counter, use -nodialog=quiet option instead. Specify the taglet class and the search paths for taglet class files. These options work the same as the -taglet and -tagletpath options supported by the Standard Doclet. For further details, please see Taglet Overview. Besides the command line options, FlexDoc Doclet provides a different more user-friendly way to specify most of the settings used by the generator. The dialog fields are initialized with the option values specified on the command line or loaded from the generator config file (see also -config option). In the «Template» field, you should specify the pathname of the main template to be interpreted by the generator. The combo-box list contains the last used templates which allows you quickly to pick one as soon as you need. The inspector contents is constructed dynamically from the parameter definitions obtained from the given template (the one specified in the «Template» field in the Generator Dialog). The parameter values are displayed and edited according to their types. The bottom panel displays the description of the selected parameter (which is also obtained from the template). The first line of the description (the white text) shows the internal parameter name. Use this name in the -p option to specify the parameter value on the Javadoc command line. See also: Handling Template Parameters. Since all document templates are format independent, if you have specified such a template in the «Template» field you can freely use any output format with it. The frameset templates are supported only by HTML output format. Similar to the template parameters, the «Options» button near the «Output format» combo-box invokes the Format Option Inspector which is specific for the selected output format. The progress bar tracks the generation progress and shows the name of the output file being currently generated. The “Cancel” button can stop the generation at any moment. Once the generation has finished or cancelled, the Generator Dialog transforms itself back to the initial state. Then, the new settings can be entered and the generation started again. At that, the Java sources information provided by Javadoc via Doclet API remains the same (as Javadoc doesn't care what exactly a particular doclet is doing with it). This allows you during the same session to generate different kinds of documentation by different templates, in different output formats and so on. When the generation was successful and the «Launch Viewer» check-box selected, the generator will try to launch an external application (e.g. MS Word) to view the produced result. See -launchviewer option for more details about this setting. Since all the content and formatting of the generated JavaDoc is programmed now entirely in the template set (which, in effect, becomes the actual doclet), what previously were command-line options provided by the Standard Doclet now simply become template parameters. But introducing and checking parameters in templates is much easier than implementing some command-line options controlling a Java code. (In fact, it is writing a parameter description what takes the most time in many cases!) So, there can be a lot more template parameters than in the case of in traditional “command-line options” approach. 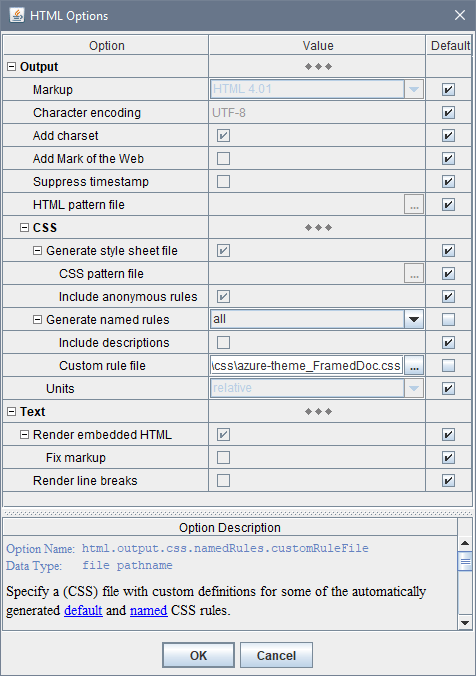 To control so many parameters, FlexDoc Doclet provides a GUI that includes the Parameter Inspector dialog (which is invoked from the main dialog on clicking «Params» button for the specified template). 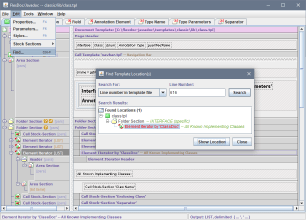 The inspector content is constructed dynamically from the parameter definitions found in the given template. Edit each parameter according to its type. View the parameter HTML description (it is also obtained from the template) as well as the parameter internal name (the first line) and possible values, which must be specified in -p option, when you set that parameter on the command line (see below). Once you have changed some parameters and closed the inspector dialog (with «OK» button), the new values will be stored (along with the parameter names) in the generator.config file. Further, the generator will use the parameter values found in that file. The same will happen when you open the Parameter Inspector dialog next time. The template parameters, whose names match those found in the generator.config file, will be initialized with the corresponding values from that file. The parameters are organized in groups (which may contain subgroups and so on). A group heading may also be a parameter itself. Each parameter group may appear in expanded or collapsed state like a tree node. The group states are also saved in the generator.config file to be restored again when the inspector is invoked next time for the same templates. Using inspector popup menu, you can quickly reset all parameters in a group to their default values. The check-boxes in «Default» column indicate whether the default values of the corresponding parameters are used. The default value of a parameter is specified in the parameter definition in the template. Alternatively, the default value may be calculated dynamically from the values of other parameters or settings by a special FlexQuery-expression also specified in the parameter definition. The same parameters in different main templates may have different default values. When a parameter is specified in the Parameter Inspector, its value is saved in the generator.config file. If the parameter value is NOT found in that file, the default value will be used (or calculated). Besides the Parameter Inspector dialog, you can always set any template parameters directly on the command line using any number of -p options. The parameter values specified with -p options on the Javadoc command line will override the values of those parameters found in the generator.config. A possibility to specify template parameters on the command line may be particularly important when you prepare an Ant or Maven build file. But that seems like your will have to fill your build file with lots of -p options for all those numerous parameters. Right? Actually, not! Rather than specifying all the template parameters (and other generator settings) directly with command line options, you can use Doclet GUI to prepare a special generator.config file and, then, provide only that file with -config option. That should start the Doclet GUI. Edit with the GUI all the settings you need (including all template parameters) and click “OK” button in each dialog where you have changed anything. That will cause all new settings to be saved in your specified config file. Above this, you can still use any other options (like -p and -o) to override selectively the corresponding settings stored in the myconfig.config. Since the version 1.6.0, FlexDoc/Javadoc supports a possibility to use many of Standard Doclet Options along with (or instead of) the template parameters. Such options like -author or -splitindex can be mapped to the default values of the corresponding template parameters. So, by using them you actually specify again some template parameter, implicitly now. However, it means that whether and which Standard Doclet options are supported depends on a particular template set. The primary reason why we needed to process Standard Doclet options was because the recent versions of Maven always emit some of those options no matter is there a custom doclet or not. Although the Javadoc itself does not mandate for a custom doclet to process any Standard Doclet options, without doing something about them, FlexDoc Doclet would simply fail now under Maven (because Javadoc requires for any non-core option to be recognized by the doclet). To deal with that problem, since v1.6.0, FlexDoc Doclet includes a list of all possible Standard Doclet options (along with their parameter numbers) so as to tell Javadoc that any of such options has been recognized (in case it was fed to the doclet). As a by-product of this, it became possible to read those options within templates and initialize from them the corresponding template parameters. Since the version 1.5.6, FlexDoc/Javadoc supports multi-valued template parameters (which we shall call also list parameters, for short). List parameters allow you to pass into template the whole vector of different values associated with the same parameter name. This provides a universal mechanism for implementing a user control over how a set of templates processes a certain type of data (or situations) that may come in unlimited number of variations. Before this, such functionality was actually emulated with a string parameter, whose value was expected to contain separate items delimited with a special character (e.g. semicolon). That representation was parsed in a template so as to produce from it an array of values that could be used in further processing. For example, so was implemented (before v1.5.6) the processing of filter.byTags.exclude.classes and show.qualifier.omit parameters of the basic template set. Now, the parameter inspector also represents the whole value of a list parameter as a concatenation of all value items (represented as strings) delimited with a separator character. However, there is no need any longer to process that string representation within a template. Rather, it will be parsed automatically by the Template Processor (as well as the parameter inspector ensures its integrity). All possible escapes related to specifying of the value of a list parameter as a whole can be found in the «Parameter Description» window. 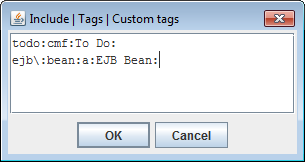 As an example of extensive usage of escapes, see description of include.tag.custom parameter of the basic template set. The quotes are needed here because the full parameter value contains spaces and must be treated as a single command-line argument. In the estimation phase, the generator quickly passes over all the source data and partially interprets the involved templates. During that, it collects the names and location of all documentation files to be created and all possible hypertarget locations within them. It also makes an estimation of the total generation time in order to graduate the progress. During the estimation phase, only the message "Scanning data source, please wait..." is displayed on the generator dialog's progress bar (or printed on console). Please note, the estimation phase may take some time! On a huge project (plus a slow computer), it may last several minutes. This does not mean, the generator hangs. Please wait! During the generation phase, all template components are being fully interpreted and the real output generated. The progress bar is alive and shows what's being generated at the particular moment. Without Doclet GUI, an estimated percent of the finished output will be periodically printed. Data source exceptions (in the case of FlexDoc/Javadoc, these exceptions may come from the Doclet API). FlexDoc/Javadoc templates are plain text files, where every component/property definition starts from a new line. So, having a line number in the template file, you can open it in some text editor and find the necessary line. However, that won't be very useful because templates are not supposed for manual editing.